Holiday World opens this Friday at 10.00am for the trade. The 2019 Holiday World Show will welcome the largest Visit USA Pavilion in the show’s 30 year history. Travel experts from across the states will be showcasing over 40 destinations, from wine tasting in the Napa Valley to theme park adventures in Orlando and the Wild West Region. 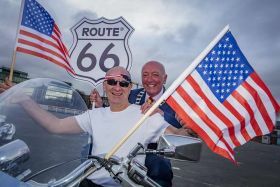 It has never been a better time to take the opportunity to engage with USA trade partners with more lift available from Dublin, Shannon and Cork Airports direct to more USA Destinations than ever before.